The Jardin du Luxembourg is situated in the 6th arrondissement ande measures 224,500 square meters (22.5 hectares). The Jardin is the 2nd largest public park in the entire city of Paris. At its center is the Luxembourg Palace, which now houses the French Senate. Entrance to the public is forbidden, so the Senate building can only be viewed from the exterior. Dotted throughout this park are statues depicting royal French women, and others depicting characters out of Greek mythology. There's in addition the Medici Fountain on the northeast, an outstanding example of the Italian fashion where kids sail small boats. Pony rides are also accessible, depending on the season, in addition to a puppet theatre and merrygo-round, all on the southwest corner. For the more culturally minded, take a visit to the Musée du Luxembourg, which specializes in classical paintings. Nature lovers can visit the Orangerie, a quiet area full of botanical arrangements and brilliant flowers. The park's very success lies in the manner it has been perfectly incorporated into routine city life, and provides a perfect place for people watching. "Please note, however, that sitting or lying on the grass is strictly forbidden in certain areas of the park. As you wander around, pay attention to any sections with signs that read “En Repos” - translated, that means “keep off”. Circling the garden is a jogging trail, usually frequented by buff French cops. You can generally see the locals since they have a tendency to workout in perfectly complementing fit clothes. The garden was founded by the Marie de Medici in 1630 who wished for it to look just like her hometown of Florence, Italy. After Marie, the garden was ignored by following monarchs till 1780 when the Comte de Provence (who later became Louis XVIII) sold the eastern part of it to enlarge Paris. During the French Revolution, the new leaders determined to enlarge the garden even more. To do this, however, they had to capture property belonging to the Carthusian monks, adding another forty hectares. Gabriel Davioud also contributed during this period by producing ornamental gates and fences, in addition to the brick garden houses that still scatter the place. He favored the English style gardens with meandering trails and a more natural look. By the early 1900s, there were 70 sculptures in the garden, as well as a rose garden, a fruit orchard, and greenhouses. Today, there are over a hundred statues, monuments, and many fountains that are scattered throughout the Jardin du Luxembourg. 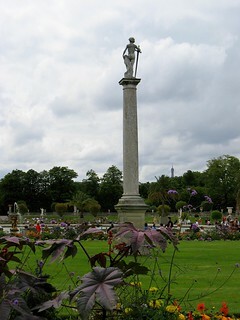 The Jardin du Luxembourg can be accessed by the Metro by taking the Odéon. If you are in a suburb, take the RER (train B). Entrance to the Jardin du Luxembourg is free, and is generally open beginning at 7:30 am, though this does change according to season. Found on the St. Germain des Pres, it's likewise bordered by the Boulevard St. Michel, the Rues de Vaugirard, the de Medicis, the Guynemer, and the Auguste-Comte. Please note that while Parisian parks generally charge no entry fees whatsoever, nearly all are walled in behind metal bars, and entering any previous closing hours is regarded as a criminal tresspass. Outside the gardens, close to the entry on the Boulevard St. Michel and Rue Vaugirard, there are photography exhibits that are free to the public. These are consistently updated and feature a diverse array of artists and artist co-ops.